What are ECO Funnels® made of? They are made out of High Density Polyethylene (HDPE). Do ECO Funnels® resist solvents? Common laboratory solvents such as acetone, hexane, acetonitrile, etc.are fine to use with the ECO Funnel®, as are most other chemical solvents. I use a 1 Gallon amber glass bottle to collect waste. Is there an ECO Funnel® that I could purchase separately to use with my 1 Gallon bottle? And what is the cap size? Yes, any ECO Funnel® with a 38-430 closure will work. They come either in 8" (EF-3004C) or 4" ( EF-4-38) top diameter. However, be careful using our funnel with glass. Over tightening on glass screw threads can cause the screw cap to disconnect from the funnel body. Do you have an ECO Funnel® available for a 5 Gallon stackable carboy, or a 30 or 55 Gallon Drum? Yes, custom funnels with special adapters (to fit most containers) can be special ordered from us. Would an ECO Funnel® comply with the regulations for emission of volatile from open waste containers? Yes. The primary function of the ECO Funnel® is to reduce the emission of volatile solvents to near zero, while providing a measure of convenience in handling temporary wa stein the lab. Are there any chemicals that should be avoided when using the ECO Funnel®? Yes, you should avoid strong acids, bases and oxidizers. Can the ECO Funnel® be kept on the waste bottle 24 hrs a day? 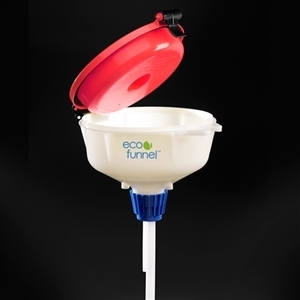 We recommend that the ECO Funnel® be used in a similar manner as any frequently used funnel. ECO Funnels® will cut down on fume evaporation and reduce exposure risk to the end-user and the occupants of the building. ECO Funnels® are to be used for collection of temporary waste only. The waste generated must be transferred to a more permanent container (drum)frequently. What about Pressure build-up inside the waste bottle? Under normal circumstances,pressure built up from adding waste to a bottle is released through the pressure relief tube molded into all ECO Funnels. Additionally, when the funnel lid is latched and closed, slight pressure can be released through use of 1 or more Vent Filters, which can be custom fitted to your ECO Funnel and utilize a glass micro fiber filter to catch emissions as it releases air through the funnel side wall. When using with HPLC applications that result in slow pressure build up inside the closed ECO Funnel, CP Lab Safety recommends adding 1 Vent Filter (VF-201) for every one or two HPLC lines attached to a Safety ECO Funnel®. The end user is responsible for knowing the volatility of the chemicals they are using. Check with the chemical manufacturer for more information. Have a favorite bottle that I use for collecting waste. Can you make an ECO Funnel® for my bottle? Yes, they can be special ordered on a custom project basis. Customer must provide enough information about the containers or a sample of the container with the cap. A price quote will be provided, or you can call us at (888) 322-5722 for immediate assistance.